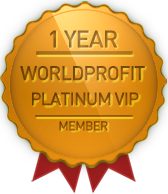 George points out that our 12 Lifetime memberships are PAID FOR YOU BY Worldprofit. You get to keep these no matter what. George also makes it a point to explain how the Silver Membership is a training program that you get for 30 days to LEARN how to generate leads and income using the 12 memberships and the hundreds more out there. Just wait, this won't fail! Yours In Success, George Kosch Webmaster http://GeorgeKosch.com George Kosch is co-founder of Worldprofit and has been in business online for over 20 years.